You can buy my ebook "Our Experience with House Cows" on Etsy, Lulu and Amazon, or email me on eight.acres.liz at gmail.com to arrange delivery. Have you ever thought about owning a house cow but don’t know where to start? Do you dream of unlimited raw milk, manure and beef to complement your small farm activities? “Our experience with House Cows” is an eBook written by a house cow owner to help other small farmers get started with a cow of their own. 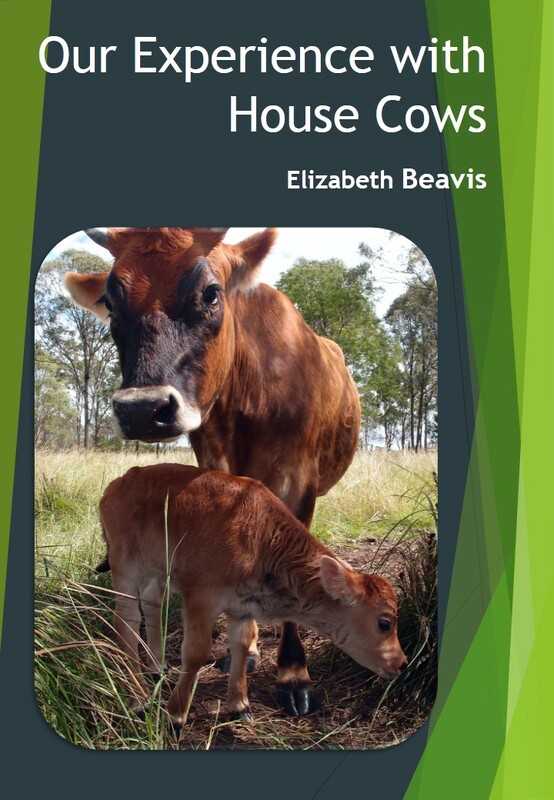 The eBook is written for Australian conditions, particularly sub-tropical Queensland, but much of the information is applicable to cows and cow owners all over the world. This eBook covers the basics of getting a cow, getting her in calf, milking her and caring for her calf, all using natural methods. The final sections explain how to use all that milk to create delicious dairy products! The eBook references several other cow, cattle and dairy books which are useful to the new cow owner and explain some aspects in more detail. Go ahead, learn how to realise your house cow dream today! The eBook features 41 pages of information and gorgeous house cow photos. 2. Why own a house cow? 5.2. Pregnancy care and "drying off"
Follow Eight Acres - the blog's board Eight Acres - the blog: Keeping a house cow on Pinterest.